A CONTEXA installation can be supported with manual workstations. The formula is split automatically in two parts, one dosed with the robot and one send to the manual dosing station for completion the last line of a formula manually. The integration of the manual dosing station allows total traceability of the formula and guarantees high quality for the end customer. The manual dosing system is available on a mobile station for an easy integration in the production flow. 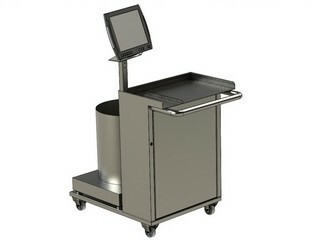 The trolley is equipped with a scale, battery and touch screen of a user-friendly management of the manual dosages. Connected to a Wi-Fi the formula is downloaded automatically in the system.